Quick Mid-Monday interruption – I just received this e-mail with a sneak peek into the March Must Have box, and I wanted to share with all of you. 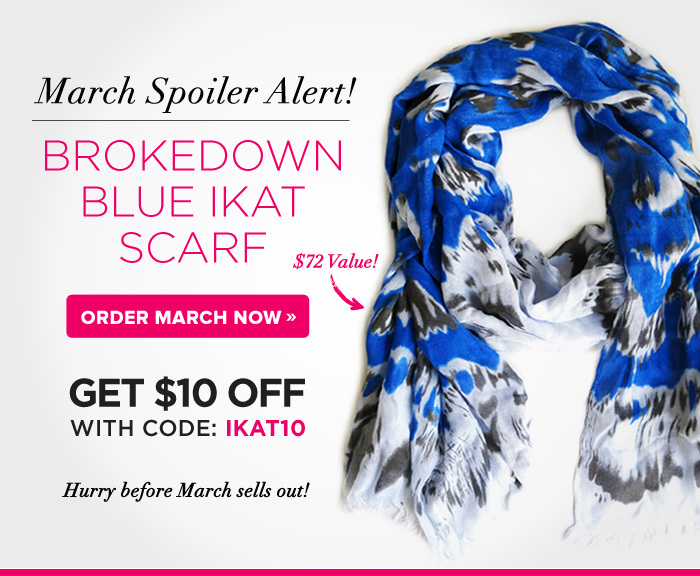 How gorgeous is this Ikat scarf? I’m so excited for my box to arrive!! There’s still time to purchase a box for yourself! Use code IKAT10 for $10 off, making the entire box (including shipping) just $30. Leave me a comment if you subscribe to Popsugar also, and what you think of this spoiler! PS…I purchased an extra box to give away to one of you! Details on how to enter coming soon. How long have you been getting boxes? Do you like them? I just signed up for Social Bliss which is the same deal…I wonder which is better! Hey Donna, I’ve been getting the Popsugar box for over a year now, and I love it! I really enjoy that they send FULL-SIZE products, and that they cover every genre, not just makeup. I’m a foodie, home decor enthusiast, and fashion and beauty lover…I want a little of everything! So good to know! I am all the above too so it seems like I may just have to try it! Thanks for the advice—plus I think it is a great idea to purchase for a give-away on the blog…Might have to do that sometime too!